Looking for more ways to use the new Membership Directory? The ASCO Membership Directory has long been a popular benefit for members, allowing for quick searches and referrals. The Society is pleased to announce that this online resource has been updated to make connecting with ASCO colleagues easier than ever. From either the search results or your myCONTACTS list, you can click the “Refer to Patient” link and send an email to your patient with the member’s information. From search or myCONTACTS, you can also learn more about any member by clicking on their name and going to their profile, where you will find their contact information, type of practice, Board certifications, other memberships, oncology specialties, research involvement, current volunteer activities, and contact information for patients. New with this update, you will also be able to print a patient-ready referral from a member profile page. myCONTACTS at Meetings: Displays which colleagues in your myCONTACTS list are attending upcoming ASCO meetings. Simplified Search: Offers a single search field for speedy searches that don’t require a lot of extra details. Simply enter a name or organization and search. Featured Accomplishments: Our new badge icons highlight members’ awards, publications, Conquer Cancer Foundation support, and volunteer service. Twitter Integration: Include your Twitter handle in your profile, and fellow members can follow you and view your latest tweets directly from your member profile. 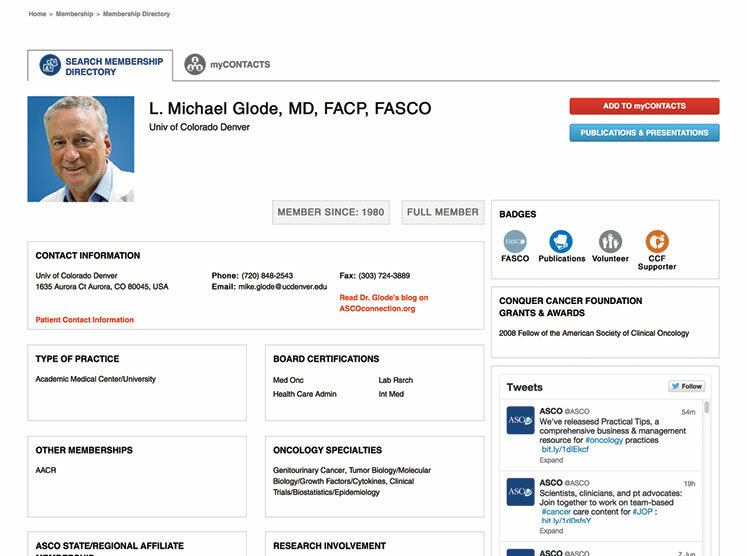 Please visit the new Membership Directory at asco.org/membership-directory and use your member log in to access all the features.